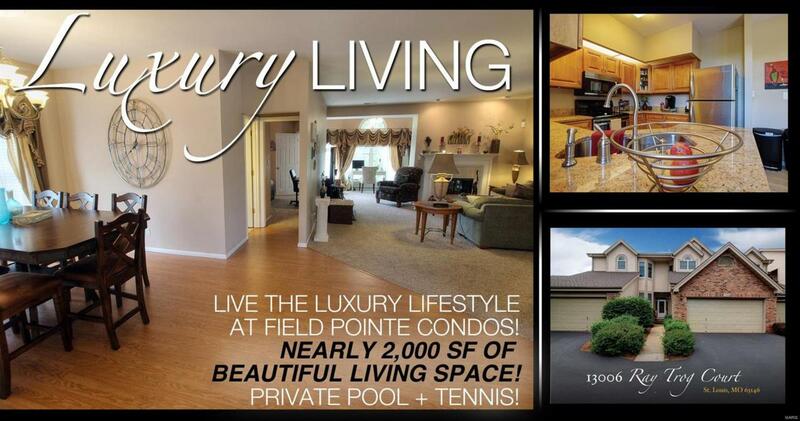 Welcome to one of THE NICEST condos at Field Pointe! From the moment you step in, you will feel right at home. Truly ready to move-in, this beautiful space has been wonderfully updated throughout and has a gorgeous look and feel to it. Floor plan is open, airy and bright w/lots of windows and a beaming 2-story entry with skylight. The layout is really spacious with a large dining area, big eat-in kitchen, super relaxing living room that has a 2-sided fireplace with a bonus room on other side that has a wall of windows - attached to your intimate outdoor oasis via the deck. Bedrooms are on opposite ends so great for privacy. Master is huge with a gorgeous bath that features granite and a HUGE walk-in closet. Guest bath also has granite with modern vessel sink. Kitchen is lovely! Custom flooring, amazing cabinets, stainless appliances, granite tops, high ceilings, lots of natural light and a walk-in pantry. 2-car garage and plenty of storage. Amenities include private pool and tennis!